Looking for what flowers to plant in your garden this season? Here’s our pick of the top 10 flowers to grow with kids. I am so happy to be here today thinking about spring and getting into the garden with my kids. Hi, I’m Jen and I write at the blog Kitchen Counter Chronicles. If I look out my window right now, all I can see is snow, snow and more snow. It amazes me how under all that snow the flowers in our garden are busy getting ready to re-emerge. I have always thought of gardening as a certain type of natural magic. My daughters feel the same way. We have planted many flowers, herbs, trees, shrubs and vegetables over the years. Some flowers have been more successful than others…some have been more engaging than others. 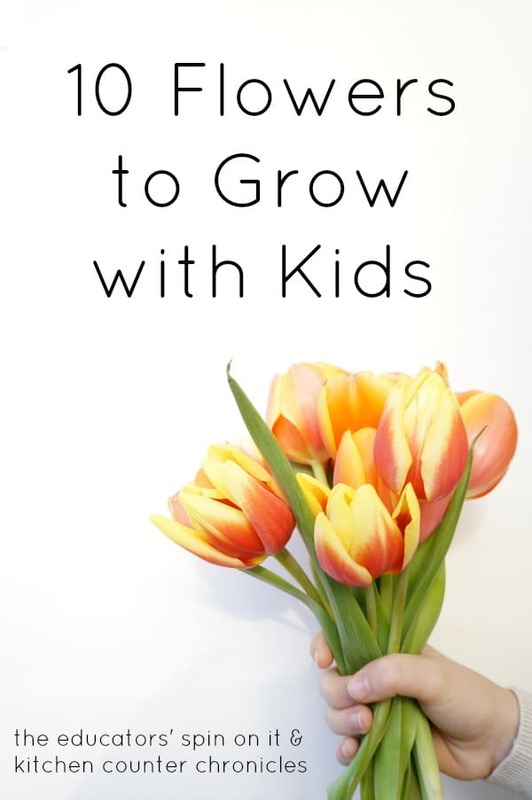 I’ve put together our favourite 10 flowers to grow with kids. I have included the flowers I have seen my daughters, and other children, enjoy the most. The flowers that engage one or more of their 5 senses tend to be the most interesting to kids. 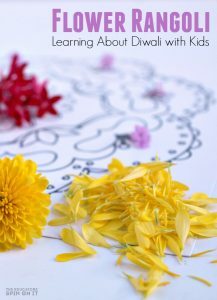 If a flower is fun to touch, smells interesting, makes a particular sound, is beautifully coloured or has an interesting flavour, the children will be captivated. Daisies are a simple perennial flower to start with. There are many different varieties of daisies, you can find an entire rainbow of colours to grow. Daisies are perfect for children to grow because they so grow easily. They can be picked and they will produce more and more flowers. Children love picking flowers, touching flowers and daisies are the perfect flower to pick. Here is a plant that my children simple cannot resist touching, I can’t either. Woolly lambs ear is a perennial plant that grows quite easily in most climates. This plant is exactly what the name says…the leaves and the flowers are as soft as a woolly lambs ear…seriously. While we are on the topic of flowers that feel great, there are strawflowers. Strawflowers are a fascinating plant for children to explore. The flowers the plant produces are paper or straw-like…the petals are hard, crisp and pointy. These flowers are perfect for cutting and turning into dried flower arrangements…in fact even when the flowers are fresh they feel like a dried flower…fascinating. Moving on to another sense, the sense of smell. The sweet pea is an annual flower that grows along a vigorous lightweight vine. Sweets peas are the perfect plant to grow into a teepee in the garden, along a railing or a fence. When the small, pastel flowers open up children will understand why they are called “sweet”. The scent they produce is soft, not at all harsh. Again, these flowers are perfect for children to make bouquets for little hands. A super easy annual plant to grow in containers or in a garden. Nasturtium’s brightly coloured flowers are prolific and edible. 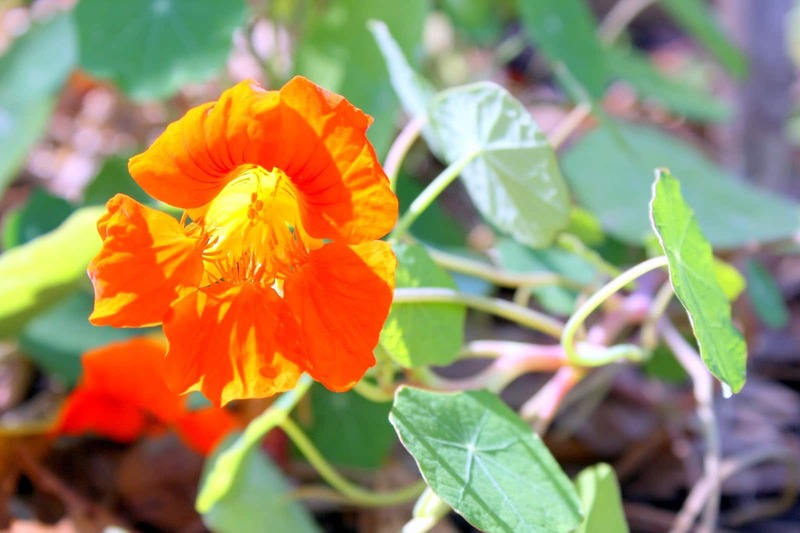 Nasturtium is a safe edible flower for children to try. Mix the flowers into a salad, or top a cupcake with a few flowers. Even if you choose not to eat the flowers, their beautiful colours will entertain children. 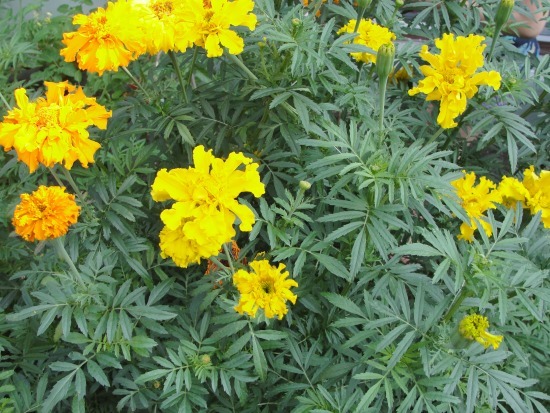 Marigolds are a fun flower to grow right from seed. There are many varieties available, the colour choices are endless. Marigolds’ flower petals are edible too. These flowers are so simple to grow and produce many flowers. Marigolds are a good option for both containers and garden borders. 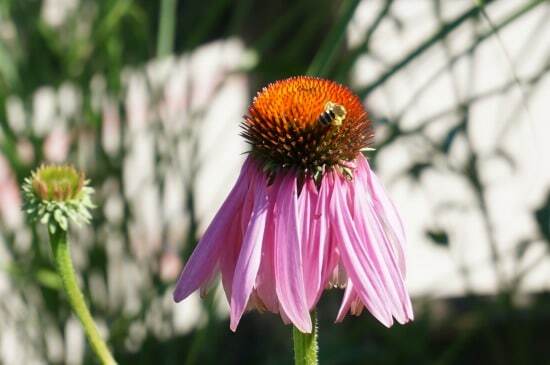 We love our Purple Cone Flowers (also known as Echinacea). 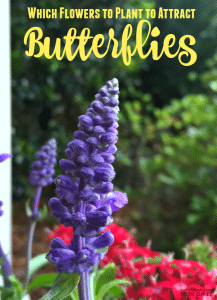 Purple Cone Flowers are a perfect flower to grow with children who are interested in learning about butterflies and bees. Butterflies find the purple coloured flower heads a lovely spot to stop and eat. Every year we see dozens of butterflies and many more bees resting on our Purple Cone Flowers. 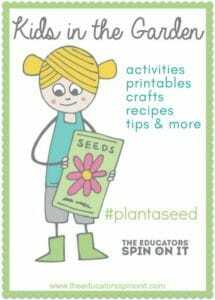 Growing a sunflower from a simple seed, is an amazing experiment for any child. Watching the transformation is remarkable. 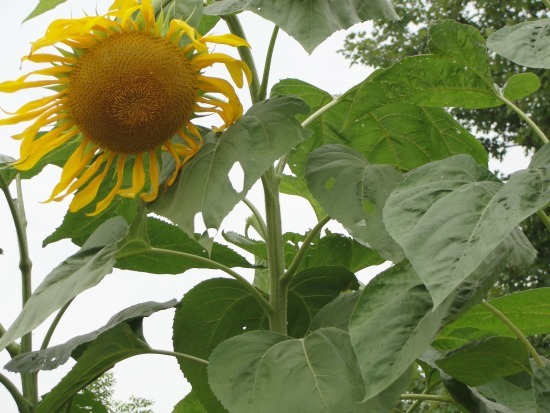 Once the sunflower’s head is fully developed children can learn how plants feed wild animals..feed the birds and the fallen seeds feed squirrels. Sunflowers take some time to grow, but the end reward is HUGE. Okay, so ornamental grasses might not technically be “flowers”, but they are an incredible addition to any kid-focused garden. There is an endless variety of ornamental grasses, with different colourings, different heights and different plumes. Ornamental grasses captivate children. As they blow and dance on the wind they rattle together and are almost melodic. We keep our grasses standing all winter long. In the winter, they sound like a trickling rain stick. Beyond the sounds they make, they are fun to cut and play with or use the plumes to like a natural paint brush. A really versatile plant. 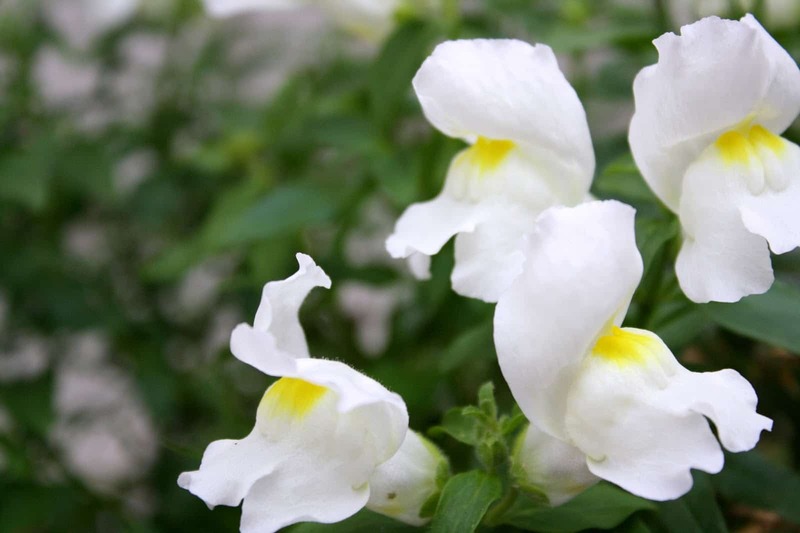 How simple is a snapdragon? Snapdragons grow well in containers or along the border of a garden. Children simply love “snapping” the little flower heads. We plant snapdragons in our little fairy gardens…fairies and dragon seem to go together so well. There is so much for children to learn in a garden, and flowers are one of areas to explore. When we make connections with our children and flowers a whole new world of discovery opens up. 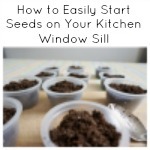 If you enjoyed this post you may want to check out my post about growing plants from seed and my post about creating a fairy garden with children. Happy spring and happy gardening! In my “previous life” I was a mental health professional…in my current life I am a stay-at-home mom with 2 beautifully adventurous kids. I share everything that lands on my kitchen counter over on my blog, Kitchen Counter Chronicles. Swing by and learn how we are greening their lives; what we are crafting, cooking and reading. While you will often us inside the kitchen, you will also find us out and about getting our hands dirty, exploring and learning outdoors. You can also follow Kitchen Counter Chronicles on Pinterest, Facebook and Twitter. We are so excited to have so many parents and teachers excited about gardening and learning with their children! To find out more about our month of Kids in the Garden; Learning and Growing click here. Today’s article is written by an extremely talented Canadian writer * who shares her families eco-friendly, outdoor, crafting, baking and exploring adventures at Kitchen Counter Chronicles. Grab your kids for this one and have them read along. Then make a list of the flowers YOU want to grow in your garden this year!!! Which flower is your child’s favorite? 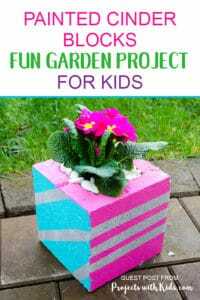 Looking for more activities for kids in the garden with flowers? Flowers are great motivators. You picked some of the flowers that I plant with my kindergarten kids. I love to garden with kids! But be careful…the sweet peas are beautiful but poisonous!